Whether you are driving Jaguar’s large XJ sedan or their nimble F-Type roadster, there is no mistaking that you are driving something special. The F-Type is Jaguar’s modern day heart and soul. Its performance roots trace back to the D-Type (yes, I know that their is a C-Type), to a time when Jaguar was the king of sports car Jungle. It wasn’t just a LeMans race winning champion. The coolest of cool, such as Steve McQueen, drove Jaguar D-Types on their every day commutes. The leader of the F-Types is the SVR with a 575 horsepower motor and all-wheel drive, but the 400 Sport takes you closer to Jaguar’s roots. It is limited edition variant that delivers 400 horsepower to the rear wheels and offer a top speed of over 170mph. The highly tuned 3.0L supercharged V6 engine produces 20 more horsepower than the standard 3.0L F-Type. The extra power paired with an intoxicating exhaust note make you want to smash the gas pedal every chance you get. It is easy to get you carried away at high speeds in this car. Luckily Jaguar has done a suburb job with the brakes, delivering strong stopping power at a moments noticed. 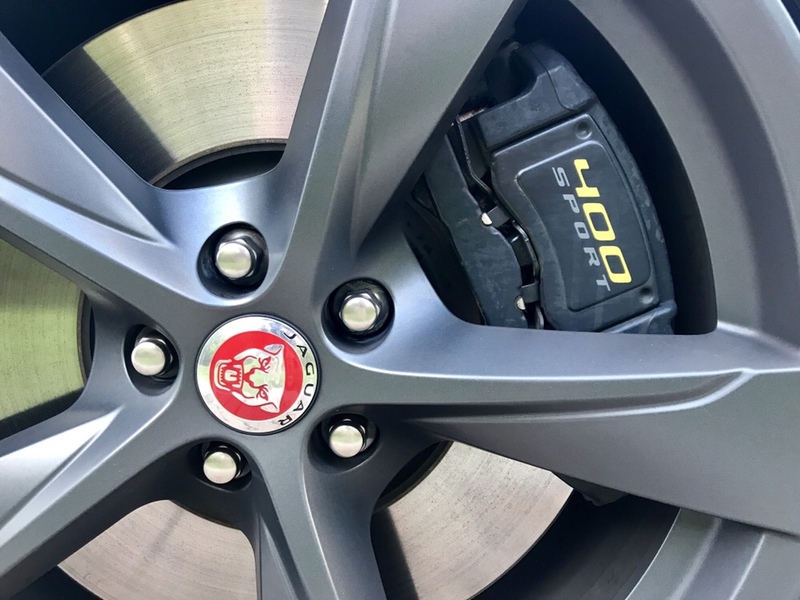 Even though cross-drilled or slotted steal rotors are not needed for the car, I would have loved to seen Jaguar utilize this technology in order to keep the brakes cooler should you decide to track this 3,514 pound car. 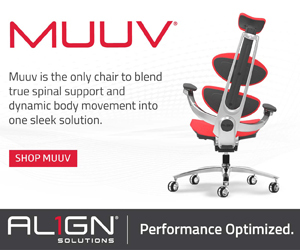 Increased performance isn’t the only thing unique about 400 Sport. There are little details scatter throughout the interior and exterior. 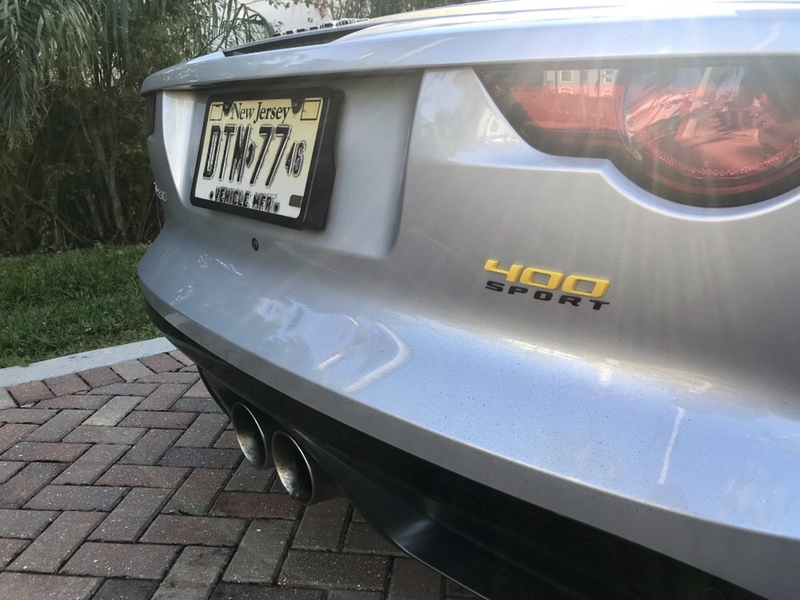 For starters, you will notice unique badging on the from spoiler, side skirts, and brake calipers. 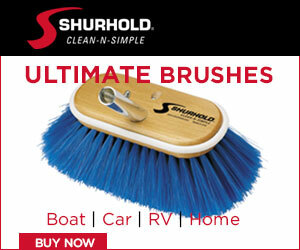 The 400 Sport also only comes in three exclusive colors. The interior boasts a unique finish that includes thick yellow stitching throughout the vehicle. 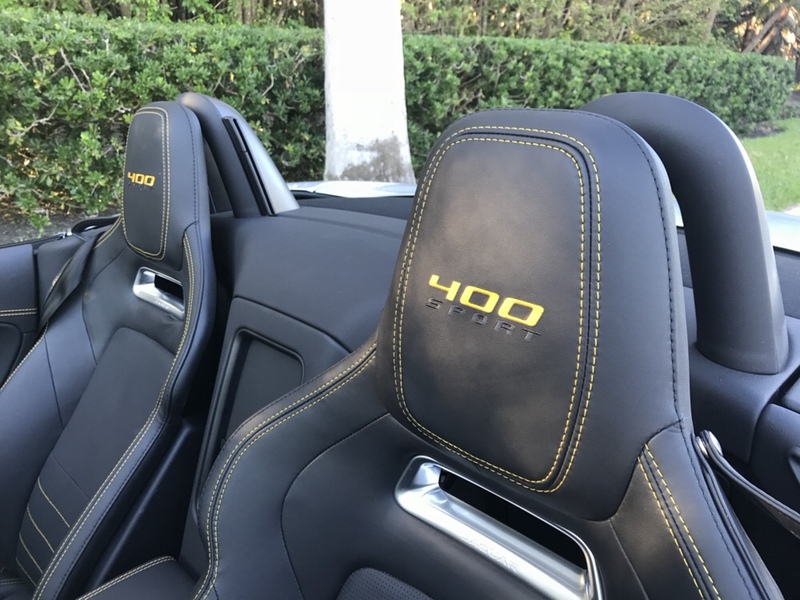 The seats are just a comfortable on long trips as the regular F-Type seats, but the feel extra special because of the 400 Sport embroidered headrests. There is no questioning that this sports car feels more like grand tourer due to the ride comfort and luxurious interior, but the feeling you get behind the wheel is all sport. The Jaguar F-Type keeps you grinning from ear to ear like a child a Baskin Robins. Jaguar doesn’t give you 31 flavors of the F-Type, but if the 400 Sport doesn’t take your fancy, you get to choose from 20 topping. The trim levels include a multitude of engine sizes, all-wheel vs rear wheel drive configurations, manual vs automatic transmissions, and coupe vs roadster. Editors note: The coupe is a sexier car, but the roadster wicked fun. Visit your local Jaguar dealership for more information on the latest F-Type, or click here to get all of the specs.